My readers who do not live in the Netherlands probably know of Teeez only because of its awesome holographic nail polishes - Outta Control, Smooth and Cool. Well, Dutch drugstore brand Teeez offers more than just nail polishes as they also have other items like eyeshadows, eyeliners and lipglosses in its range. A while back, I featured a hot pink liquid eyeliner that I bought together with the three holo polishes. Frankly, Teeez has not been very well-known even here in the Netherlands. It isn't a new brand though. From what I've read, it's been around for a number of years but I think due to various reasons (eg: limited sales points and, some say, the so-so quality), it has not been as popular as some other drugstore brands. Even my perception of the brand changed when I discovered their holographic nail polishes in the store. In some ways, this change in perception followed Teeez's own earlier image and product revamp. Now, its brand image seems to be one that's forward, cool and funky. Teeez also makes it a point to be dynamic by releasing a collection of four or five new products every three months. I've also noticed more effort on their part to reach out to Dutch bloggers. Last month, Teeez sent me (and other Dutch beauty bloggers) some eye makeup products to review. They were mainly products from their new collection with a hip name, Hypnoteeez. 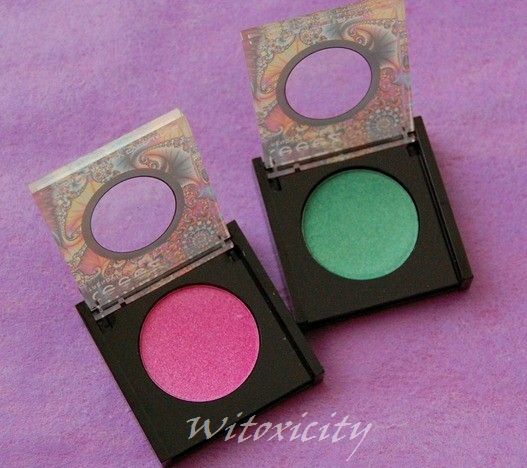 Two of the items sent were these Silk Fantasy Eyeshadows - Smooth 11 (hot pink) and Free 09 (intense pigment green). Show your sparkling eyes with these silky soft eyeshadow. The dazzling colors are long lasting and super trendy! Each of these retail for €4.79 (net weight: 3g). 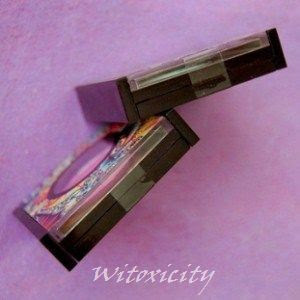 They are plastic squares (4.5cm x 4.5cm). The casing feels light and cheap, and the only saving grace is the awesome colourful tattoo-like design on the cover. They do come sealed (I mention this because not all budget/drugstore cosmetics here are sold sealed). Applied, Smooth 11 is a frosty hot pink and Free 09 a frosty almost-neon mint green. 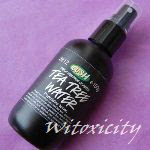 They have a typical makeup scent, not noticeable during application. If anything, I actually think they smell like some mascaras. 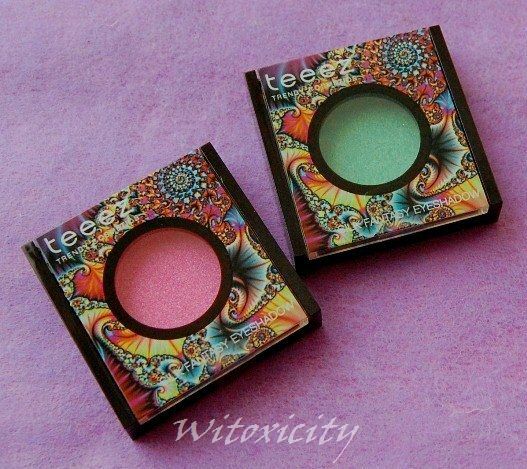 Teeez got it right: the eyeshadows are silky but firm to the touch, almost like rubbing your finger on slippery styrofoam (I mean that in a good way). It is lightweight and has a frosty finish. Good pigmentation but needs an eyeshadow primer to bring the colours to life. Smooth application, allows for easy layering to build intensity. 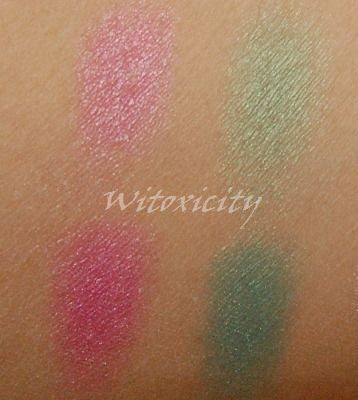 For these eyeshadows, I like using a sponge-tip applicator or my finger to apply. With an eyeshadow primer, creasing was minimal except for the inner corner of my eyes (my usual problem area) some five-six hours later. The quality and the colour payoff of these eyeshadows are pretty good for the low mid-range price of €4.79 but you would need to like frost finish to like these. Teeez is available in some countries in Europe. Please check the website for details. Kinda reminds me of a watermelon . It's pretty . That brand isn't available here but their eyeshadows look nice. Cute look--maybe I should look around to see how their nail polishes are lol. I'm so out of the loop. Nice color, I haven't try to put pink and green color's in my eyes. I usually put in same color but in light and dark shades combination. E agora estou encantada pelos produtos de maquiagem, perfeitos! And now I'm bewitched by makeup products.Perfect!! 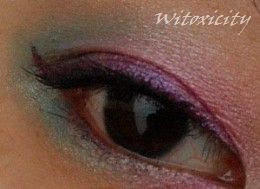 The combination of pink and minty green (with the purple eyeliner)looks so refreshing...me like. It looks really fab on you. Thanks for the great review and for showing this great look for a sunny summer day. Yeah, the design on the packaging is really funky. I'm a sucker for such things too. Haha! I like both colors, they are very pigmented!! Teeez products have amazing packaging, I really love it. I like the colorful packaging, you are right about the tattoo-like design. Totally loving your eye look, it's different from your other looks though. The purple wing looks gorgeous with the green and pink. 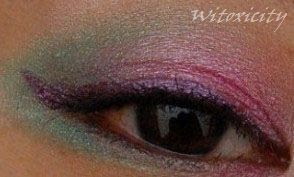 And the combo of green and pink eyeshadows for the eyes are great! It says 'Summer'! It's a summery look indeed! Yes, I've noticed that you like the lighter shades, so these two colours are very you. These shadows are pretty good but the frostiness does emphasise the fine lines and wrinkles on my eyes. Haha! The green is very pretty, I might pick that one up.